This is going to be a big month at theaters across the nation. There are many strong contenders for box office glory, including the likely winner of the title of Biggest Box Office Hit of 2006. There are a nice variety of genres represented, including animation, horror, and TV Remake. Let's move on to my top 10 for July 2006. Leading off the month during the first weekend is July's and very likely the year's biggest hit. The entire cast returns in this sequel to the wildly successful film based on the popular Disneyland ride. The first movie was so successful that the ride is being upgraded and modified to include Captain Jack Sparrow as one of the characters. 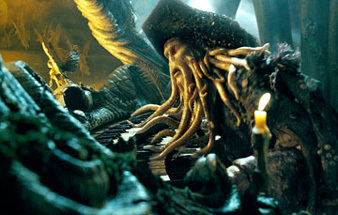 Johnny Depp did a brilliant job playing Captain Sparrow and is continuing with this sequel. I would not be surprised at all if this film surpasses the $300 million mark in domestic revenue. Also, keep in mind that the third film in the series was already filmed and will be released during the summer of 2007. Will that one even surpass the numbers that this film puts up? It's very possible. I think this film definitely has the potential to draw huge crowds during opening weekend. There seems to be a lot of anticipation with regards to this release. The TV series has become a classic and the studio has been sure to cast a couple of big names in the roles of Crockett and Tubbs – Colin Farrell and Jamie Foxx. The only piece missing is the advertising build-up to this end of the month release. If they play their cards right, the studio could end up with a smash on their hands. There has been a lot of advertising building up to this film's release on the 21st. There were teaser-trailers early on and now we're seeing a lot more about the film. Well, at least we're seeing more shots of the house making a meal of unsuspecting victims. The premise looks interesting and the studio has left enough out of the trailer to make audiences wanting to find out the full story. I think the advertising has been well played and it will show in this film's success, both opening weekend and down the road during its theatrical run. There are some pretty creepy commercials being show in conjunction with M. Night Shyamalan's latest release, but that happened with the last few as well. I'm really of the opinion that if this film is a disappointment, moviegoers are going to start losing their faith in Shyamalan to make successful films. He may be heading down that same track currently being traveled by Wes Craven. This definitely looks like a horror film so I think we'll see some spillover from those fans and it should make for higher revenue.